BOP ON TREND: Throwback Thursday. #tbt for many reasons today: To last Thursday when Jill and I decided to man up and celebrate Halloween in not-so-true to Mean Girls form and to 1992 when ripped jeans and band tees were IT. Wayne and Garth frolicking with purses? Doubleshwing! This got me thinking about the recyclability of fashion trends. If you hold on to something long enough, will it inevitably go back in-style? Countless times I have heard my mom recall while flipping through the new Bloomingdales' catalogue, I used to own one just like that! My response is along the lines of wishing she held onto said piece because I'm sure it was made with lasting quality and was far less expensive than whatever the price for said piece is now (and would probably be worth much more today because it is vintage). Personal style and what is considered "in" evolves. There are always those pieces you wonder, What was I thinking? but then there are those you are happy you held on to. While I don't know what I would do without multiple chambrays in my wardrobe now, five years back, I don't think I even owned a chambray or knew what "chambray" was even referring to. Flashing back to 1994, a "denim button down" was what me and my dad sported, along with a pair of dirty bucks that I also own again today. Of course this idea of holding onto something with the intention of wearing it at a much much later date can't exactly work when you are still growing, but it proves the point; Fashion has the tendency to repeat itself. 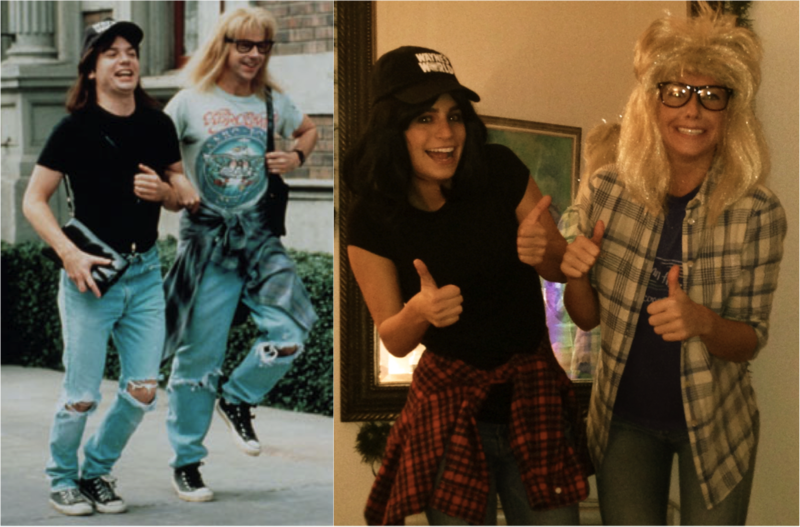 I happen to think dressing as Wayne and Garth had to be the easiest (and might I add, one of the most fun) costumes I have ever done because of what it took to pull it together: Flannel? Check. Concert tee? Check. Large hipster shades? Washed out denim? Converse? Check, check, check. I even believe those patent leather purses they're wearing are pretty HOT to today's standards, maybe a bit reminiscent of a Kate Spade clutch. What pieces in your wardrobe do you think are worthy of holding on to? Will wedge sneakers soon be out to only be back in again?